1. After complete installation, the sandbox runs fine, I can run jobs, log on to ambari, hue but once I suspend the VM, and try to load it again a few hours later, the network is disabled so I can neither login Ambari, nor can I open Hue. (screen shot attached) Why the network is disabled and cannot be enabled again?? 3. I m not able to set time of talend. Its lagging behind 12 hours. 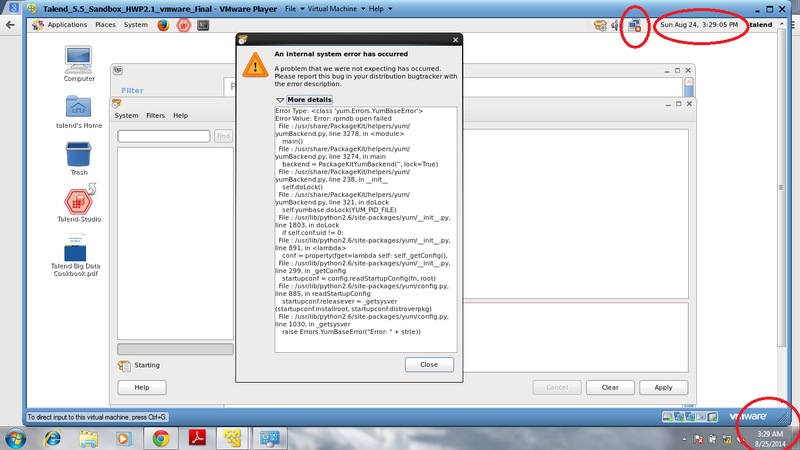 First, you should not suspend the server, you should shut it down and restart the vm every time. If you reboot the network issues should go away. To shutdown on the Hortonworks VM under the "System" Menu click on "Log Out Talend" it will ask to Logout click on logout. it will automaticly re-log you in and when you click on the "System" menu a second time you will see the shutdown option. It may ask for the root password which is "hadoop". Or you can just go to the command line on a terminal and su to root then give the shutdown command. "shutdown -h now"
thanks a lot Talend team, for solving my problem. I followed your instruction and its working now.